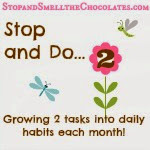 Stop and Smell the Chocolates: Life Verse Necklace Giveaway! Wow - I can't believe I get to offer you such a fantastic giveaway!! I think some of you might even come out of hiding to enter this one - LOL! Have you "met" Christine from Life Verse yet? Not only does she write at Life Verse Blog, she also designs absolutely beautiful bracelets and necklaces for her company, Life Verse Jewelry. She is a Christian mom who is passionate about what she does and what she believes. I have had the pleasure of getting to know Christine mainly through Twitter (see how I'm always mentioning how Twitter has been good to me?!) where she can be found as @LifeVerse . I enjoy my conversations with her and especially the fact that she tweets out Bible verses regularly to share with her followers. Recently Christine sent me one of her necklaces. It's beautiful!! It's a sterling silver Scripture Verse Necklace. Bible verses are etched in a spiral and a silver charm hangs with it. Mine says: The Lord bless you and keep you - Numbers 6:24. Not only is this a classy piece of jewelry, it is a lovely reminder of the Lord's blessings that stays with me throughout the day. These necklaces would make wonderful gifts for mothers, daughters, graduates, and more. Thank you Christine - I love it! 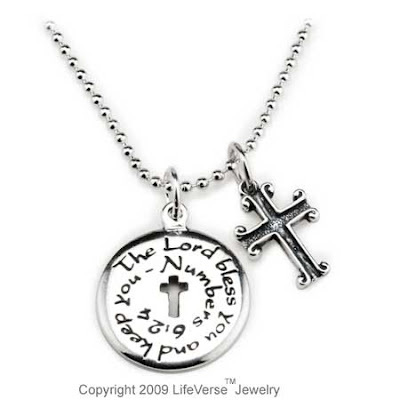 One winner randomly chosen from the comments (determined by random number generator) on this post will win a Sterling Silver Scripture Verse Necklace from Life Verse Jewelry!! This giveaway is only open to U.S. residents. To enter, visit Life Verse Jewelry and then leave a comment on this post telling me which necklace is your favorite! You can gain one additional entry for promoting the giveaway by: emailing friends & family, sharing on facebook, sharing on twitter, posting on your blog, or other creative ways! Please leave me a separate comment telling me how you promoted the giveaway. This giveaway will end on Wednesday, September 9 at 10pm Pacific time and I will announce the winner on Thursday, September 10! With you always necklace... way beautiful!!! I love @lifeverse she's a great tweep! BEAUTIFUL necklaces with WONDERFUL scripture. My fave is "Be Still"! I have never seen these! How beautiful! Matt 28:10 is my favorite! Oh how cute! I like the Be Still one. But I'd be happy with any of them. Big you can't go wrong with scripture around your neck size hugs to you! Oh, I love the Be Still one... I need to be reminded of that lots. I really like the "My redeemer lives" necklace. Thanks for promoting these...they're beautiful! All Things Possible necklace. Because sometimes we need that reminder that all things are possible with Him. I like the Job one, but they are realy all lovely. My fav is the "I am with you Always" necklace. What a great giveaway!! Hi, I'm here via Cathy's tweet. I pray Numbers 6:24 each day over my kids when they go to school, so I suppose that would be my favorite. It'd be fun to give to my daughter. Thnks for the great opportunity. I'll be browsing your blog, too. Have a great weekend! My Favorite is the With You Always Necklace! You can check out my Tweet here.. I'd choose the With You Always necklace. They're all so pretty, it's a tough choice! I love them all. My favorite is the All Things Possible necklace. How beautiful is her work?!!? I'd love to win the All Things are Possible or the With You Always necklaces! With you Always is my favorite as it reminds me that God really is there, a lesson I am learning right now. Beautiful Jewelry! I will add this to my sidebar! I love the "Be Still" one ... a much-needed reminder in my life! Beautiful!! Her jewelry is awesome! i'm likin' "My Redeemer" i think! Hope you're havin' a GREAT weekend! I love the necklaces. My favorite is be still. I'm really torn - its hard to choose, the are all awesome. The first one, All Things Possible, is so inspiring! The charm of the cancer ribbon though, doesn't pertain to me (thank God). The second one is a wonderful reminder for me - can you tell I talk alot? I often say much to much when I should trust God and listen to Him in the stillness I like the footsteps charm, also. I would like very much to give my daughter the Bless You one. She's only three though and wouldn't appreciate it for years. The I am with you always is a beautiful one too and I like the heart charm! Oh dear they are all perfect reminders of everything we need! I would have to say my favorites are Be Still and Bless You! Bless you is probably my favorite out of those. those are so cool! i love the "with you always" verse from Matthew. so glad I stopped by today! I like the Life Verse™ Necklace- With You Always...sometimes it's easy to forget, He is with you always. With You Always necklace is my fave! Love it! 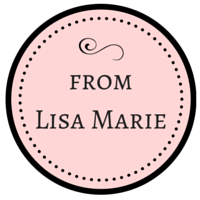 You have an awesome blog, Lisa! I'm following you now! I am with you always... I have a friend going through chemo right now and this would be perfect for her. I facebooked this as well. I really like the necklace that has Ps 46: 10 "Be Still". Yes, it did bring me out of the woodwork. 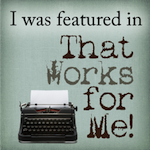 :) I do keep up with you on bloglines whenever you write. I like the My Redeemer Lives necklace although my Life Verse is Jeremiah 29:13. Thanks for the giveaway. I love the "with you always". When things get me down, and I think there is nobody to help me, I remember there is One! Wonderful website, beautiful jewelry. Love the Denim Scripture Bracelet ... my favorite! I LOVE the With You Always necklace -- thanks for the fantastic giveaway. I am always following your blog via RSS feed on my home page. I love the "Be still" necklace. I will become a follower. Love with you always. Posted of FB page. I love them all- but if I had to pick, Be Still would be my favorite. I have too many favorite verses. "Children are an heritage from the Lord, offspring are His reward, blessed is the man who has his quiver full of them." My computer was not cooperating last week and is still giving me problems, but I love you and your givaways. I like the All Things Possible necklace, because it reminds me that I CAN get through nursing school, and I WILL.